It's been a few months since I picked up Doctor Who: Prisoners of Time. As you may recall, I was less than impressed with the first issue and the cost of the issues ($3.99 each) left me thinking I might be better off waiting for the inevitable trade collection. Still, the Tom Baker incarnation of The Doctor is my favorite and my Friendly Local Comic Book Shop saw fit to set aside a copy of this issue for me. So I decided - why not? I'll give it a go again. And I'm quite pleased to have done so. Visually, this book is a definite improvement on the first issue. I found the style reminiscent of that used for depicting the adventures of The Fourth Doctor in the old Marvel UK Doctor Who comics. The established characters are all well caricatured and the action of the issue flows well from panel to panel. Hats off to Gary Erskine and Mike Collins for a job well done! In terms of story, this issue is on par with the first and continues the idea of telling previously untold tales of The Doctor's past with elements from the new series being added in. 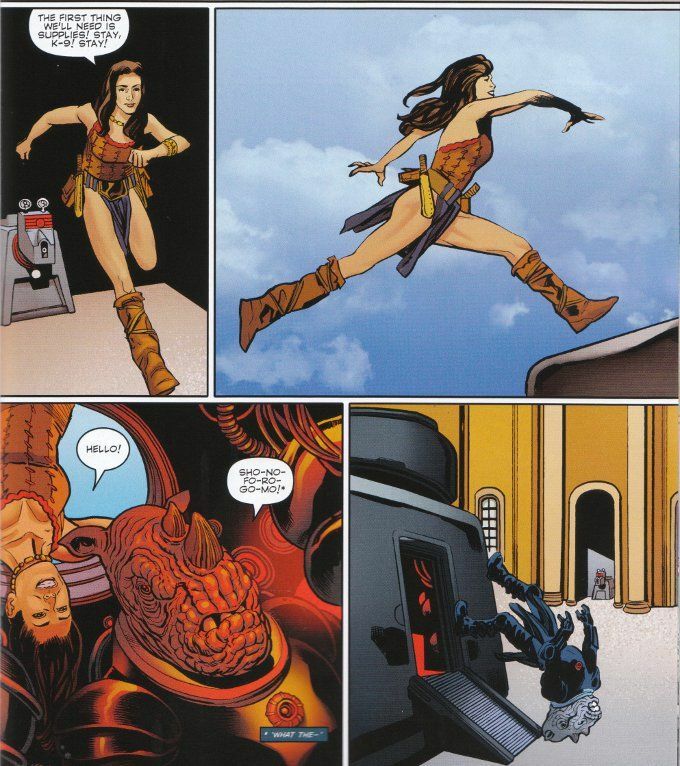 The plot focuses upon The Fourth Doctor, his best friend K-9 and his current companion - the savage warrior woman Leela. The trio must locate a stolen jewel before the planet they are visiting is torn apart by the Judoon mercenary police officers who have been brought in to locate the gem at any cost. The script by David and Scott Tipton is fun and well-paced, perfectly capturing the spirit of all the established characters. I'd rate this comic as a Must-Read piece of work. The artwork is good, perfectly capturing the feel of a classic Doctor Who comic. The story is action-packed and interesting. Really, there's no good reason not to get this comic if you're a fan of Doctor Who in general and The Fourth Doctor and Leela in particular.